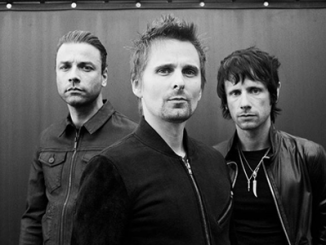 MUSE will headline Belfast Vital on August 23rd at Belfast’s Boucher Road Playing Fields. Tickets are on sale now. MUSE will be joined by special guests BIFFY CLYRO, NOTHING BUT THIEVES and Dublin band FANGCLUB. 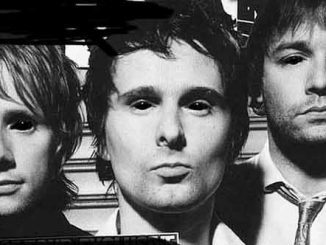 MUSE: Since their debut in 1994, Muse have released seven studio albums and have won numerous awards, including two Grammy’s, two Brit Awards, five MTV Europe Music Awards, eight NME Awards and they have sold over 20 million albums worldwide. Last year Drones, the group’s seventh album, topped the UK charts whilst simultaneously topping the charts in the USA, a first for the band. In total the album reached No 1 in a staggering 23 countries. In 2016 Drones won the Grammy for Best Rock Album at the 58th Grammy Awards, the band headlined the Glastonbury Festival for a third time and they toured arenas across the world including sold out shows at Dublin’s 3Arena and The SSE Arena, Belfast. 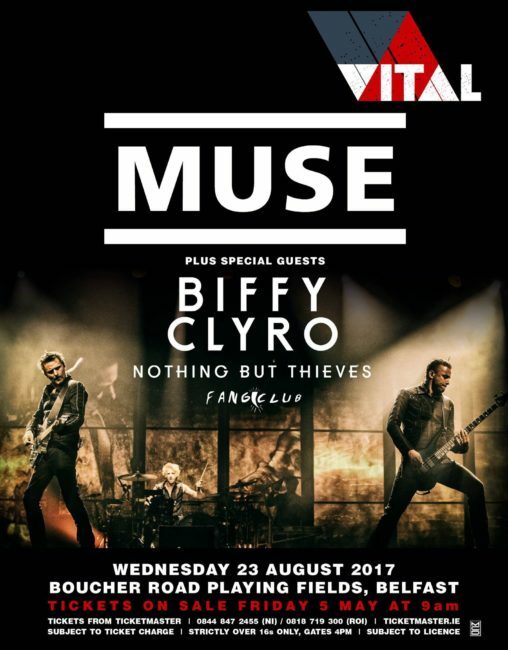 This summer Muse will headline Reading & Leeds and today it has been confirmed that they will also headline Belfast Vital on August 23rd. BIFFY CLYRO: Last year Biffy Clyro released their seventh album, Ellipsis – a number one record in the United Kingdom, Germany, Ireland and Switzerland and has since hit gold status selling over 100,000 copies. The band followed Ellipsis with a remarkable run of huge scale touring which set their riotous energy to a dazzling visual spectacle. Last summer Biffy performed to almost 200,000 people when they played their biggest Scottish show to date at Glasgow’s Bellahouston Park, headlined sets at the Reading & Leeds Festivals and Belsonic at Titanic Belfast. The band ended the year with a triumphant UK and Ireland arena tour, which included shows at The SSE Arena, Belfast and the 3Arena, Dublin. This year is already shaping up to be just as momentous as Biffy Clyro are now confirmed for their first headline set at Download and are booked to perform at this year’s Belfast Vital. NOTHING BUT THIEVES: The past eighteen months have been a whirlwind of sold out shows, chart topping records and a critically acclaimed album from Southends finest band. Nothing But Thieves are now riding the wave of a global buzz which has already well and truly ignited in the States. As well as sold out shows in the UK, Japan and USA they have recently completed a successful run of European arena shows with fellow Brits, Muse. This summer Nothing But Thieves will play Glastonbury, Reading & Leeds and are now confirmed for Belfast Vital.